I started making these little ecosystems a year ago and have some nicely established moss in the ones that I have kept. The rest were sold on etsy. Rinse charcoal and place in jar first. Add gravel as the next layer. Carefully arrange moss and plants inside jar. Add ceramic figure and water. 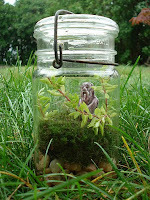 Display your terrarium in a window, on a porch or patio where bright but indirect sunlight will reach it. You can keep the terrarium outdoors until freezing temperatures arrive in your area. You may want to initially add a few ounces of water to your terrarium if it seems dry. Water lightly! Mist the terrarium with a spray bottle to add water. It is vital to keep the lid on your terrarium in order to sustain a humid environment for your plants. Notes: Moss has a shallow root system that does not penetrate deep into the soil. Moss grows slowly so do not expect to see anything happening over night. Remember you often find it growing on rocks and trees. Moss thrives in low-nutrient environments! Warning: The more sun that directly hits the terrarium the hotter it will become inside. Essentially it is a mini greenhouse where plant life is sustained in a controlled environment.